Lathan Goumas - lgoumas@shawmedia.com United States Navy Hospital Corpsman Third Class Kylee Thompson talks with Logan Blyth, 10, during a program honoring veterans and active military personnel at the Special Education District of McHenry County campus in Woodstock, Ill. on Friday, May 24, 2013. Lathan Goumas - lgoumas@shawmedia.com The Captain James A. Lovell Honor Guard prepares of the presentation of the colors during a program honoring veterans and active military personnel at the Special Education District of McHenry County campus in Woodstock, Ill. on Friday, May 24, 2013. Lathan Goumas - lgoumas@shawmedia.com Retired United States Air Force Captain Gary Stec, of Woodstock, gives a red, white and blue streamer to Ali Munoz, 4, during a program honoring veterans and active military personnel at the Special Education District of McHenry County campus in Woodstock, Ill. on Friday, May 24, 2013. 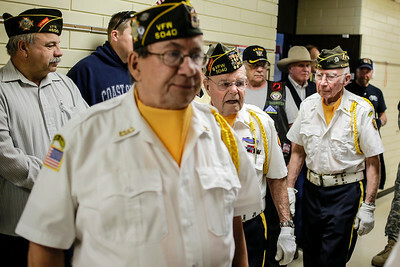 Lathan Goumas - lgoumas@shawmedia.com Members of the Veterans of Foreign Wars Post 5040 and other veterans enter the gym at the Special Education District of McHenry County campus in Woodstock, Ill. during a program honoring veterans and active military personnel on Friday, May 24, 2013. Lathan Goumas - lgoumas@shawmedia.com Retired United States Army Private First Class Frank Frednoble, of Woodstock, salutes during a program honoring veterans and active military personnel at the Special Education District of McHenry County campus in Woodstock, Ill. on Friday, May 24, 2013. 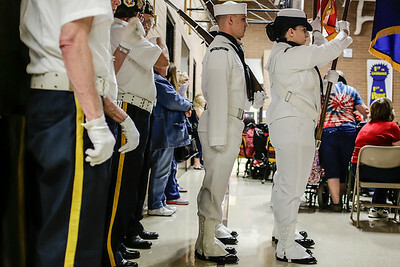 Lathan Goumas - lgoumas@shawmedia.com United States Navy sailors Shaun Jacob, Nathan Nixon and Kylee Thompson peer in to the gym during a program honoring veterans and active military personnel at the Special Education District of McHenry County campus in Woodstock, Ill. on Friday, May 24, 2013. 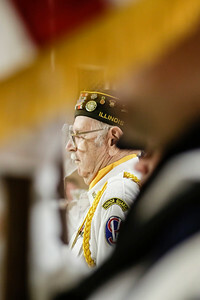 Retired United States Army Private First Class Frank Frednoble, of Woodstock, salutes during a program honoring veterans and active military personnel at the Special Education District of McHenry County campus in Woodstock, Ill. on Friday, May 24, 2013.